EMbaffle® is a world leader in innovative heat transfer solutions that offers global industry clients significantly improved operating efficiencies with reduced energy consumption, emissions and costs. By combining technical innovation with extensive operating experience the company provides practical solutions that are showing tangible benefits for refining, chemical and solar power plant units worldwide. Patented EMbaffle® heat exchanger technology offers a step change in shell and tube type heat exchanger design. 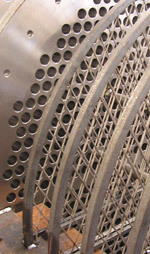 Expanded metal baffles (tube supports) create an open structure allowing for longitudinal flow at the shell side. Stagnant or 'dead zones' found in traditional segmental baffle heat exchangers, which tend to foul rapidly, are not present in EMbaffle® heat exchangers. Tube vibration is also eliminated due to the longitudinal flow characteristics and pressure drop is lowered.